This recipe for Vegan Crab Cakes looks like the real thing and tastes even better! 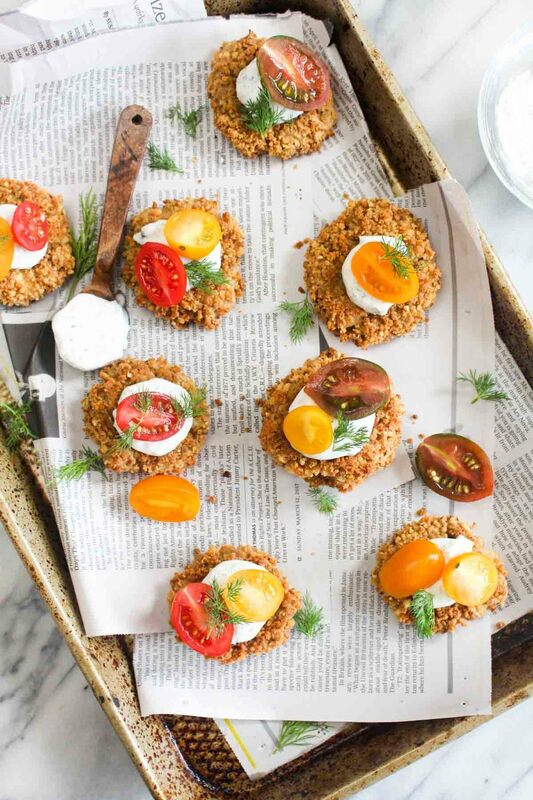 These healthy bites are vegan and gluten free. In a small bowl, whisk together all of the sauce ingredients. Set aside. Preheat the oven to 425 degrees. Line a baking sheet with nonstick foil. Coat it with coconut oil spray. In a bowl, stir together the hearts of palm, artichokes, shallots, celery, and agave. In another bowl, whisk together the oat flour, Old Bay and salt. Add this to the wet mixture and stir well to combine. For the breading station, whisk together the oat flour, Old Bay, and a pinch of salt and pepper into one bowl. In another bowl, whisk the almond milk, Dijon mustard, and a pinch of salt and pepper together. In a third bowl, add the breadcrumbs. Take 2 tablespoons of the crab cake mixture and form it into a patty. Place it into the oat flour and coat all sides evenly. Submerge it into the almond milk and immediately remove it. Let any excess liquid drip off and then add it to the breadcrumb bowl. Coat with the breadcrumbs, using your hands to cover all sides evenly. Place on the baking tray and repeat with the remaining batter. Bake the crab cakes for 25 minutes, flip them over and bake for another 25 minutes. Remove from the oven and let them cool for 10 minutes to fully set up. Serve with sauce and toppings, if desired.